Mix sugar, rum and cayenne pepper in an airtight plastic bag. Mix well until incorporated. Add pineapple slices and refrigerate for 30 minutes. Remove pineapple slices from bag. Set the sugar-rum preparation aside. Pre-heat your broiler on high. Roast pineapples for 2 minutes on each side, or until you see grill marks and the slices are hot. Serve immediately with the sugar-rum preparation as a side dish or with ice cream as a dessert. You can marinate the pineapple overnight. 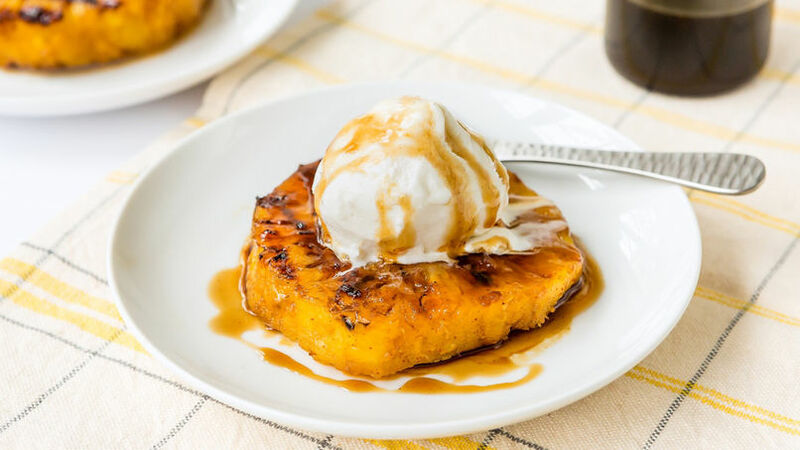 If you've never tried roasted pineapple with rum, you've been missing out! There's just something wonderful about rum, sugar and pineapple combined! I created my own version by adding a bit of cayenne pepper for a spicy kick, and everyone loved it! You can serve this as a side dish, inside a burger, as a topping for your hot dogs or tacos, or as a dessert. It's that versatile! Enjoy it!